This sword is the famous weapon of Dakkon Blackblade, one of the most popular cards from Legends and the one who is possibly considered the most off-color pie nowadays. I do think the designers’ interpretation of the color pie can be a little rigid at times, but I’m not sure I have space to discuss that fully right now; instead, I’ll point out that its cost doesn’t necessarily make it a legend-only equipment in practice when you have cards like Stonehewer Giant or Danitha Capashen on hand, and also that there are legends who become incredibly dangerous with even a minor boost. Not only does Dominaria itself have some intriguing possible bearers like Arvad, Shanna, and Lyra Dawnbringer, if you can get it attached early to a seemingly simple creature like Yargle, Glutton of Urborg or even Isamaru, it makes it pretty hard for an opponent to keep up. For a card named Blackblade, the ability sure feels Green. Black is much better at creating multiple mana from a single land ergo Cabal Coffers. Blackblade Reforged is an homage to Dakkon Blackblade of course. Many have wielded this weapon, Dakkon of course, Korlash, Belzenlok, and now Gideon. Bonus points if you manage to equip Gideon with this card as it only costs 3. 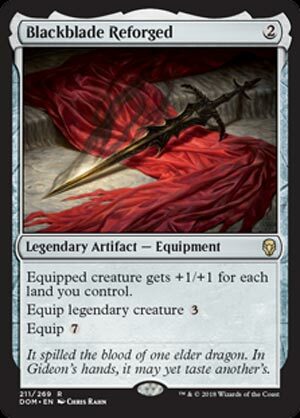 Blackblade Reforged wants to be in a Historic deck, but White has access to tools to get around the high equip costs with Puresteel paladin or Nahiri, The Lithomancer just to name a few. While playing with this card I found its scaling to be interesting. Sure ideally you want to equip this card ASAP, but paying 7 to give a creature +7/+7 is nothing to scoff at. Sword of the Animist has great synergy with this card as well. Talk about a limited bomb. Blackblade Reforged sticks onto a creature and makes it massive; even “on-curve”, you’re potentially giving a creature +3/+3, with the opportunity to make it even larger as the game goes on. A lowered equip cost for legendary creatures is certainly new (and sticking with the theme of Dominaria rather nicely), but seven mana is doable in a long game. I don’t think Blackblade Reforged is good enough to see Constructed play, as you need to spend five mana to get it online at minimum, but it has a lot of payoff for a reasonable body, and it’s capable of ending lives all the same.